Leaked information from NUS HQ gives more detail on what the cuts to democracy will look like. According to our source, the proposals are currently being worked on by NUS Acting Chief Executive Peter Robertson and unelected trustees such as Aiden Grills, CEO of Leeds University Students’ Union. The six full time Liberation Officers (Women’s, LGBT (x2), Trans, Black, Disabled) will be downgraded to part time, possibly unpaid roles. Part time Sections Officers (International Students’ Officer and Postgraduate Students’ Officer) will become unpaid volunteers, and these roles will be subsumed into the three new Vice President roles: Higher Education, Further Education and a new vague ‘Student Opportunities’ post. These will replace the five current Vice President positions (Welfare, Society and Citizenship, Union Development, HE and FE). The Nations will have funds for just four officers between them. Currently NUS Scotland and NUS Wales have four and three officers respectively. It isn’t clear if this includes Northern Ireland, whose NUS-USI campaign have funding from a different source. The Block of 15, the portion of the National Executive Council elected at National Conference, with guaranteed representation for women and FE students, will be abolished. Instead, onus will be put on student union Presidents to form a new steering group to hold NUS officers to account termly. This means ordinary students will no longer be able to run for the NEC at National Conference, hold the leadership to account or pass motions to determine what NUS does between conferences. National Conference will be cut from two and a half days to just two days and one night. The delegate entitlement for Student Unions will be cut to potentially just one delegate per union. This is likely to be taken up by a President or other sabbatical officer. Minimal elections will happen at National Conference. Instead there is likely to be greater use of national ballots and union block voting. Even without elections, two days will mean an even more packed agenda with little time to discuss motions. National Conference will be a room of sabbs talking to themselves. NUS will become even more of a careerist club, with no space at conference for serious political debate, dissident left wingers and students from underrepresented groups, or likely any students who aren’t sabbatical officers. It’s clear that these reforms go beyond making ‘necessary cutbacks’. An earlier leaked report stated that the cuts to officer posts were “not for financial reasons” but about making the organisation more “effective”. The £3 million deficit is being used as cover for a complete shutdown of NUS rank and file democracy, drawn up by unelected and highly paid CEOs and forced through with no say from the membership. We demand NUS open the books to members before any discussion takes place about reform: cut backs must first be made to waste and bureaucracy, including the corporate-style senior management structure. The student left also needs to discuss urgently how we can transform our student unions from ‘service providers’ into campaigning, democratic bodies that fight for students, unrestricted by charity law. On 15 January, the Trustee Board will meet to vote to approve the calling of a Company Law meeting. This will be made up of an appointed person from each union (likely to be the President or CEO). Our source says delegates will be encouraged to attend remotely and vote via email to guarantee no disruption from students. Company Law meetings are usually only used to ratify constitutional changes passed by National Conference. In this case, NUS management are pushing for the Trustee Board to call a Company Law meeting in advance of National Conference in order to cut ordinary NUS members out completely from discussing any changes to democracy. The reforms described above could be ratified and set in stone by such a meeting within fourteen days. It’s vital that the NUS NEC vote no confidence in the Trustee Board before this meeting on 15 January can ratify a Company Law meeting to sign off on the coup. Send them a model email here. So far, no NEC members have come forward to say they will stand up for NUS democracy, liberation and ordinary NUS members, instead of staying silent or siding with unelected management on hugely inflated salaries. We need to keep up the pressure! Join the campaign to stop the democracy shutdown here. We’ll be discussing how to escalate the campaign. Get in touch about hosting a meeting on your campus to spread awareness of the democracy shutdown as part of the speaker tour hosted by the Student Left Network and Justine for NUS President- Save NUS Democracy. Email studentleftnetwork@gmail.com or message the page. 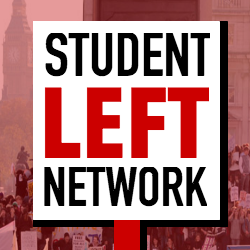 Come to Student Left Network National Conference on 2-3 February in Sheffield and discuss how we can transform our student unions and NUS into political, fighting bodies.